MamaInsomnia: My first blog hop! As much as I'd like to, I don't always find enough time to fit in my blogging. And the thing I usually miss most is reading and connecting with other bloggers. 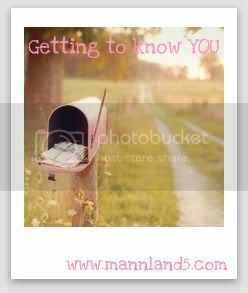 So since I have today off, I thought I would catch up on some blogs while Jack is playing in his jumparoo and I stumbled on MannLand5's "Getting to Know You" post. I am a new reader of MannLand's blog, but so far so good. And I love a chance to meet some fellow bloggers! So here's the deal. I answer the questions and then link my post up to their list. Yes. My usual line- "There's a bat in the cave"
My husband, son, family and friends come first and foremost. Before that I kept the old fashion kind of journal...since I was 13. I have 4 volumes of my life stored in our crawl space. But Sangria or a Summer Shanty are my go to summer drinks. My i-pod is all over the place. When I put it on random you could go from Cypress Hill, to Tori Amos, to Lady GaGa, to Glee songs. Take my birth control pill. I'm not quite ready for any more babies just yet! I hope to get out and go to some great BBQ's, take Jackson out to the zoo and other places, spend some days at the pool, and find time to relax with my boys! Burt's Bee's Pomegranate Lip Balm.